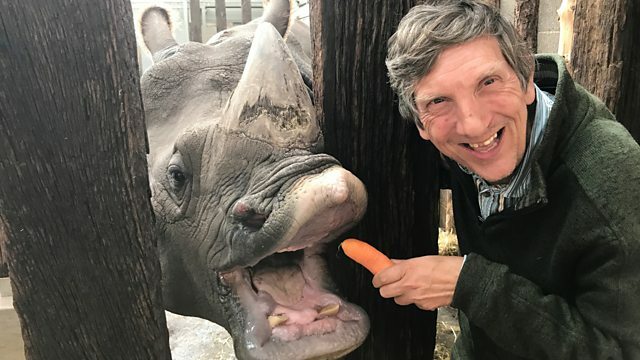 Brett Westwood meets a rhinoceros nose to nose and is blown away - by the sense of wonder engendered by this prehistoric-looking yet gentle and water-loving animal. Mark Carwardine is a zoologist, an outspoken conservationist, an award-winning writer, a TV and radio presenter, a widely published wildlife photographer, a best-selling author, a wildlife tour operator and leader, and a magazine columnist. Mark presented the six-part BBC-TV series Last Chance to See with actor and comedian Stephen Fry in search of endangered species as they followed in the footsteps of a similar journey Mark made with Douglas Adams, author of The Hitchhiker’s Guide to the Galaxy, 20 years earlier. He has also written more than 50 books on a variety of wildlife, travel and conservation subjects and presented the weekly half-hour programme Nature on BBC Radio 4 and the daily Environment News bulletin for Steve Wright in the Afternoon, on BBC Radio 1. Kelly Enright is the author of Rhinoceros, Maximum of Wilderness: The Jungle in the American Imagination and Osa and Martin: For the Love of Adventure. She also wrote one volume in the America’s Natural Places series, Rocky Mountains & Great Plains. Her work focuses on portrayals of nature in American culture, human-animal relationships, museums, and travels. She is Assistant Professor of History, Director of Public History at the at St Flagler College in Florida, USA and is currently examining memorials to extinct species. Lawrence Norfolk is the author of The Pope’s Rhinoceros (1996), Lempriere’s Dictionary (1991), which was praised by Malcolm Bradbury as ‘one of the finest novels of the Nineties’and In the Shape of a Boar (2000). These three books have been translated into 24 languages. He is a winner of the Somerset Maugham Award and the Budapest Festival Prize for Literature. His books have been shortlisted for the IMPAC Prize, the James Tait Black Memorial Award and the Wingate / Jewish Quarterly Prize for Literature. His latest novel is John Saturnall’s Feast (2012). Kate Sutherland is a Associate Professor at Osgoode Law School in Toronto, Canada and is author of the poetry collection 'How to Draw a Rhinoceros', which was nominated for an Association for the Study of Literature and the Environment (ASLE) creative writing award. She has written several literary pieces, including “The Necklace” in The New Quarterly, Winter (1997), Summer Reading: A Collection of Short Fiction (Saskatoon: Thistledown Press, 1995), and “Lucia” in Prairie Fire (1992). Shelley has worked at West Midland Safari Park for 21 years. She initially completed her work experience at the Park as a school student, where she then went on to study Animal Management at college. After gaining her qualifications, she joined the Wildlife Team and has worked her way up the ranks to her present position of Deputy Head Keeper of Asian Ungulates. She has worked with one-horned rhinos since they first came to the park in early 2010 and adores each of the rhinos with their individual characteristics and unique quirks. Looking after them is hard work but very rewarding, and Shelley looks forward to going to work to see them each day.